Shadow Shifts 101: Community Experiences for All Members - The Junior League of Boston, Inc.
At the Junior League of Boston, we are assigned a single volunteer placement for each year we are members. This gives us an opportunity to build stronger relationships while doing activities such as teaching adolescent girls healthy cooking skills or honing specific skills like fundraising. As much as we like providing the girls and organizations we serve regularly occurring faces, sometimes members enjoy variety. To allow members to sample what the league has to offer, the concept of Shadow Shifts was introduced in 2013-2014. This hands-on program gives members a tremendous opportunity to explore community placements to which they’re not currently exposed. Members can now experience JL Boston’s many interactions with the community and volunteer in a whole new way. Germaine Lawrence campus is a residential treatment program for adolescent girls who are experiencing family, school and social difficulties. The goal of the running club is to expose and educate the girls, allowing them to experience one of the many tools such as running that supports a healthy lifestyle. It’s intended to facilitate a passion for their health and wellness through physical activity. JL Boston Arts (Boston Renaissance Charter School and East Boston) JL Boston Arts is a structured group mentoring program for fifth grade girls that focuses on improving girls’ wellness through arts education to support self-expression, confidence, collaboration and leadership. 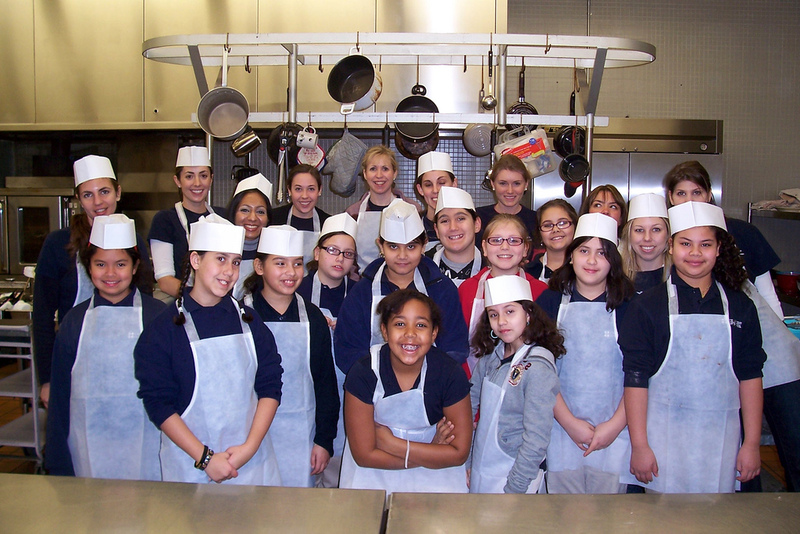 (BRCS and East Boston) Kids in the Kitchen engages sixth grade girls in three key areas: 1) nutrition education, 2) healthy and safe food preparation, and 3) physical activity. At the final session, the girls cook for their families and share with them what they’ve learned in an effort to transfer healthy habits into the home. Leader Within Leader Within is an experiential and academic group mentoring program for sixth grade girls designed to support girls’ natural strengths through team building, writing, art-related projects, field trips, and community service. The curriculum develops girls’ leadership skills by helping them to identify and discuss issues relevant to their lives, and ultimately to take action in their communities by designing and implementing a community service project. (Allston and Charlestown) Learning Circles is designed to prepare pre-adolescent girls for success in the challenging years ahead. It builds on girls’ natural relational strengths to promote learning about oneself and pressing social issues. Members serve as role models, providing encouragement, support, guidance, mentoring and friendship to the girls. We provide opportunities for members to participate in Shadow Shifts after work on the weekdays or on the weekends. Participants become a one-day member of the community placement when they volunteer for a Shift and, as an added bonus, receive one training unit per Shift. Sound interesting? There’s still time to participate this year! In total, 80 Shifts are on the member calendar for 2014-2015, and there are 22 Shadow Shift opportunities available in April, May, and June. Members can sign up on the online calendar and can look forward to experiencing all that JL Boston has to offer next year! If you have any questions, email me! -Katy Galli joined the Junior League in 2013 and currently serves as the Leadership Education & Training Development (LETD) Coordinator managing the Shadow Shift program. She has a secondary community placement within Done in a Day and previously volunteered to develop long term strategy for the League.